I am back! I made the decision to fly home and rehab my foot. I think it was a wise choice. I might have gone crazy fighting with the trainers out here when they insisted I do squats and leg presses. I got back to Israel last Tuesday, and played that night. I didn’t feel 100 percent, but at least there was no pain in my foot. I played 18 solid minutes and came through with some clutch free throws in the last 30 seconds. I hit 3 out of 4 to help seal it, but a teammate still told me that I had let him down, because “white boys ain’t supposed to miss free throws.” A fair point. Now it’s time to analyze what is written on the side of the box that my lamp came in. I have been saying for some time that I should do quality control on the English that is used with products out here. This lamp might take the cake in terms of the abuse of the English language by Israeli advertisers. I think the copywriter put everything they wanted to say into Google Translate and hoped for the best. So two of the applications are living room and office. Aren’t those just places where you could put a lamp? Can’t I put the lamp anywhere I please? Why is it trying to limit me? But it is the next word that puts this first bullet point firmly into the strange. “Releasing.” Did they mean relaxing? Or is this lamp specifically designed to provide the proper light for releasing? Releasing seems to imply something deviant. Maybe if you are having a ceremony and you need to release a dove, this should be the first light that the dove sees. Or prisoner releases? If you have kept someone captive in your basement and you want something to shine down there in order to tell him he is finally free to go, this is the lamp for you. It just sounds off, right? Like if they had one person at the company who really spoke English he would have looked at this and decided that there is a much easier way to say that. It simply cannot be the best way to get those points across. I guess you can retort, “99% of their sales are to people who speak Hebrew, so why does it matter if the English is poorly written?” It matters because if they really didn’t care about the English-speaking base then they wouldn’t use English on their packaging. I have bought plenty of things out here that had no English on them whatsoever. This lamp company thinks it might sell to some English speakers, but they don’t care enough to use proper grammar. Shame on them. 306 degree view? Honestly? That seems like a simple catch. Math is math in any language. Similarly, panramic seems like the kind of spelling mistake that would be easily avoided if they had the aforementioned single person working on this project that spoke English. And what is a 3D swivel?The lamp can definitely swivel, but I would hardly call it “3D.” I think they are just throwing out words that might sound impressive to the lazy consumer. They want to give the impression this is some sort of crazy, space aged lamp, but it really isnt. 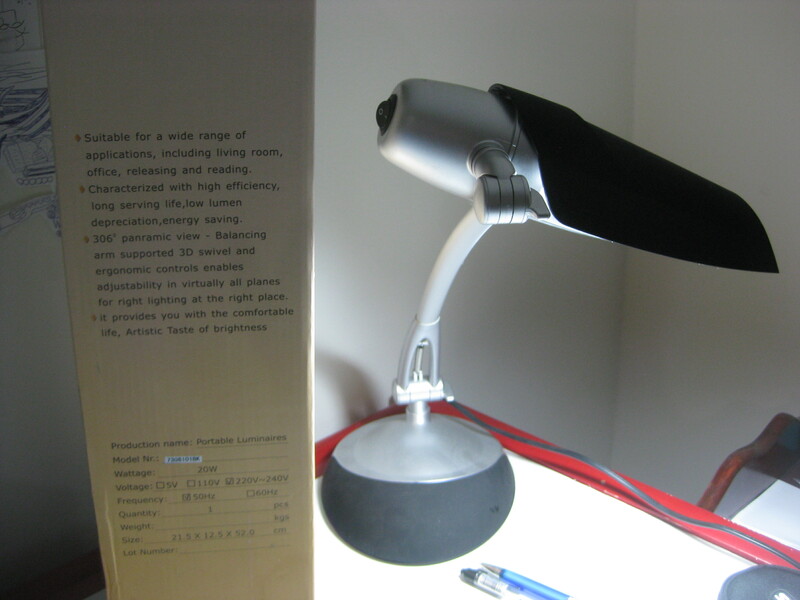 I am gonna come out and say that lamp technology might have peaked. I think they should just say “it will shine light over a certain area,” and be done with it. This lamp is going to provide me with a comfortable life? Does it come with a little lamp benefactor or something? Someone who is going to die soon and has inexplicably left me his property in his will even though we are not blood relatives, angering his family members to no end? Sorry, I have been reading Middlemarch by George Eliot, and that is one of the problems that occurs. It is a book that documents the daily lives of a bunch of upper class people in a town in rural England in the mid 1800’s. I know books are supposed to transport you to a place and make you feel what that time was like, but most of the events in this novel have stakes that are either too low or that simply don’t register with me. And that is kind of a weird thing to say coming from someone who related to the Harry Potter books. You show me a wizard boy who talks to animals and fights evil then I am on board, but you bring me into the mind of a 19th century British farmer who is worried that he might not be able to pay off a 30 pound debt and my thoughts start to wander. Disclaimer: I am making all these judgements when I am only halfway through the book. From what I understand authors usually set a bunch of things up and then all the scenarios play out as you get closer to the end, so maybe the 15 page talks about the election process to determine the clergyman’s assistant will pay off. I continue to read because it is deceptively interesting. It is also inspiring me to improve my vocabulary. It is embarrassing to be a college graduate and have to look up so many words in a book. In my defense, half the words I look up are said to be “arcane,” which makes me feel better. So anyway, this lamp is apparently going to give me an “artistic taste of brightness.” For some reason that line brings to mind those Coors light ads where they brag about having the “coldest tasting beer.” Cold is not a taste! Brightness is not a taste! Does Molson Coors Brewing Company do side work for small appliance companies in the Middle East? That would make as much sense as anything, I suppose. Ahhh, Bob! Do you carry around a mouse in your pocket…, that explains ‘WE’? That mouse or the both of you must be young, lonely and frustrated males. to their love life, except amongst other women, perhaps. ha good point, probably smart to stay mum on certain things. do you get laid a lot in israel? we’d like to hear bout that. I have a ton of funny girl stories but I try to keep it family friendly round these parts. Maybe someday. It’s a Chinese lamp, Drew. The fact that they sell it in Israel doesn’t make it an Israeli lamp. Then again, wouldn’t be as interesting to make fun of the Chinese, eh? I guess in essence I am making fun of whoever produced the lamp for an English speaking audience. Israel, China, who cares! I have a Scottish bottle of whisky with some funny stuff written on it that I might tackle next. Robyn encouraged me to read your diaries. I am glad I did. Since your enamored with George Eliot, I think you might find another Irish writer/poet interesting. I recommend ‘The portrait of the Artist as a Young Man’ by James Joyce. It reflects upon his gradual growth into artistic consciousness. It reveals his recognition of his psychic reality. I perceive your sensitive explorations of your surroundings. Your perception of the ironies that exist amidst and within Hebrew culture. The answers you find as you bounce your curious, American ball off the Hebrew wall and it’s Yiddish voice speaking to you across the centuries, as you seem to search for meaning in what surrounds you. I suppose I would experience something similar if I immersed myself in Lithuanian culture and bounced my ball off ancient walls in Vilnius or the Roman temples and Aqueducts for years of wonderment. Perhaps your humor is a way of trying to feel at ease in a strange environment. Humor is much healthier and less arrogant. I always felt very strange and foreign in the immersion of the culture while in Afghanistan. The religious belief system was not my own, yet I could relate to the common God of Abraham. The harshness of the environment and suffering of its people is a typical attitude of a desert tribe mentality. The belief system that fostered anticipation in a rewarding after-life, in contrast to the denial of rewards, within the daily reality, is also characteristic of Islam. Very strange indeed, yet quite edifying and revealing of truths when contrasted with our American belief systems, with its built-in arrogance and smugness. Be well, happy and blessed, Uncle Gary, Goody. Hey uncle gary! Thanks for the thoughtful response. I have read, and enjoyed, “portrait of an artist.” Maybe I will check out some more Joyce stuff later on.